It cannot be repeated often enough that humanity does not simply go back to work, even if it only comprises the consumption of a pension, in friendly nonchalance, after years of deepest terror. Some are tired, their ‚better self‘ has gone to sleep, and what one sees walking around among the people is no more than a bundle of artificially whipped up nerves. Others, crude slaves to their instincts, awake for the first time from the unconscious, and their new awakening is pure desire. Let’s not beat about the bush: we are all either sleepers or recently awoken. We were whipped through hell and they are now surprised that it completely wiped out the last paltry left-overs of religious education. There are still a few smart guys who keep trying desperately to blame all the excesses of these times on the puny shoulders of the German revolution. Oh, you pitiable goddess, you have sinned more than is appropriate even for the unpolitical German lady that you are, despite an occasional Russian accent, but you really don’t deserve that! Are you really to blame for the military collapse, coups d‘etat, workshyness, the decline in moral standards, the black market, declining church attendance, and cabaret? In any case, you made a somewhat greater impression last year, although even then there was no mistaking that your gown was not long enough to cover your sandals, and your voice was more shrill than sonorous. But you are not to blame. No. The German revolution is a weedy little person, and its contours provoke mockery. It has nothing to do with the heavenly hetaere which Delacroix painted in 1830. But one needs the entire German ingratitude and lack of character to be able rebuke her as a temptress. We don’t want to list all the sins of omission which she committed here, we want to remember her only positive act: she ended the war. No even half way reasonable person can doubt that the military collapse would still have occurred without mutinous sailors and Emil Barth’s Russian pop-gun. It would have been even worse: the war would have been fought out on German territory, the Rhineland would have shared the fate of Northern France, and the peace would have been worse than that of Versailles. One needn’t take the clamour against the revolution seriously, if it didn’t conceal a new way of thinking. New in its contemporary form, but old as the hills in its content: the yearning for the petit bourgeois idyll of tedious mediocrity. The old bourgeois culture is back, with a new tone. It is the secret ruler of the hour. Bourgeois culture as a psychological state, not as social concept. Its all there: aversion to the unknown, fear of experience, the intoxication of authority, servility, the yearning after undisturbed digestion. That is not the citoyen of the great revolution, not the verbose, but genuinely enthusiastic, man of the Paulskirche, it is the form of life that invented affordable morality, that can only smoulder, but never glow, that cringes when a strong fist threatens, and has no respect for achievement. The heart that never beats faster in the presence of an intellectual achievement, but the backbone that bends in the presence of as great as possible a display of external power. That’s what our new ruler looks like, dear friends, the one that sets the tone after one year of the republic. It really is, even if others still make great speeches. He tolerates it; he even likes it that he doesn’t have to do it himself, because he only emerges into the public sphere in herds, never as an individual. It’s almost as though he somehow senses the miserable figure he cuts. He makes sure that religion is confined nicely to the schools, not out of religious conviction, but just because one has to believe in something. He makes sure tha we don’t get comprehensive schools, so that education remains the privilege of his sons, who enrich and, what is even more dangerous, carry forward the types of knowledge. He complains about the lack of morals, but is absolutely convinced of the need for prostitution. He complains about the decline of the economy, but makes deals which ruin the currency. He is unmoved by recollections of the war years, and sheds tears at the thought that Hindenburg has to go around in civvies, and has to put up with being questioned by a Frankfurt Jew. The press defers to his taste, he visibly puts his imprint on the republic, which he damns. With few brains and lots of elbows, he is clearing away the last barriers. Does it have to be this way? That depends on whether one finally realizes that this citizen is the representative of a way of thinking, not of a class. That he has to do with a sort of upbringing and education, not a form of economic activity. That is what makes him powerful. That is why he is so firmly rooted, and the only real danger to the German republic. We need to hurry, he is growing by the day. The flame which flared up so fiercely is getting weaker, and will soon be extinguished. St. Paul’s church in Frankfurt am Main, the seat of the national assembly during the revolution of 1848. 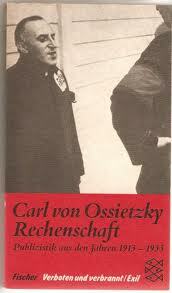 This entry was posted in 1920, Carl von Ossietzky. Bookmark the permalink.